The start of HART’s mass transit rail line in East Kapolei, seen in Dec. 2016, along Kualakai Pkwy. The Honolulu rail authority is considering handing out up to $5 million in stipends for bidders that compete for a contract for a public-private partnership to build the last 4.1 miles of rail line into the city center. The Honolulu rail authority is considering handing out up to $5 million in stipends for bidders that compete for a contract for a public-private partnership to build the last 4.1 miles of rail line into the city center. If the Honolulu Authority for Rapid Transportation moves ahead with the plan, the unsuccessful bidders who submit proposals to complete the rail line and build the Pearl Highlands transit center could qualify for up to $2.5 million each to offset some of the cost of preparing the proposals they present to the city. The stakes are high, and the bidders are expected to incur significant costs as they prepare proposals to compete for the work. The construction portion of the contract alone is expected to cost about $1.4 billion, and the winning bidder for the public-private partnership, or P3 agreement, also would earn billions of dollars more under a 30-year contract to maintain and operate the rail line. The city plans to make a final decision on the stipends by May 3, when it is scheduled to publicly release the solicitation for the second phase of the request for proposals for the P3 contract. HART’s own research into how the stipends were handled on other similarly sized projects found that a stipend of $2 million to $2.5 million per unsuccessful bidder would be more appropriate for the Honolulu project, he said. The field of competitors for the contract will be narrowed down to three developers in the weeks ahead, which means the most the city would pay under the new stipend proposal would be $5 million, or $2.5 million per unsuccessful bidder. In order to receive the stipend, Brennan said, unsuccessful bidders will have to agree to allow the city or HART to adopt and use any original concepts or ideas including design features that are proposed by bidders. Some have worried that the ongoing federal criminal investigation into the rail project could cause some potential bidders to abandon the Honolulu project, which might limit competition. The $9.2 billion Honolulu rail line is the subject of a federal investigation involving the FBI and the U.S. attorney’s office. HART has been served with three federal grand jury subpoenas seeking tens of thousands of documents, but it is unclear exactly what triggered the federal inquiry. To advance the P3 initiative, HART entered into a $1.3 million contract with the United Kingdom-based law firm Ashurst LLP in August to help develop the request for proposals for the P3 plan, and expected to run through that money by the end of February. HART asked the rail board in mid-February to add $3.4 million to that legal services contract, but the board balked and added only $1 million to the contract for the time being. The board also set up a committee to review the work plan for the law firm. In all, staff said HART estimates it will spend $9.775 million for legal support services for the P3 initiative, according to HART Deputy Executive Director Nicole Chapman. House Judiciary Committee Chairman Jerrold Nadler, D-N.Y., presided at a meeting, March 26, directing the attorney general to transmit documents to the House of Representatives relating to the actions of former Acting FBI Director Andrew McCabe, on Capitol Hill in Washington. The House Judiciary Committee will ready subpoenas this week for special counsel Robert Mueller’s full Russia report. WASHINGTON >> The House Judiciary Committee will prepare subpoenas this week seeking special counsel Robert Mueller’s full Russia report as the Justice Department appears likely to miss an April 2 deadline set by Democrats for the report’s release. The planned committee vote, announced this morning, would not automatically issue subpoenas but authorize House Judiciary Committee Chairman Jerrold Nadler, D-N.Y., to send them if he decides to do so. Support columns for the rail line rise near the airport. The first segment of the line, from Kapolei to Aloha Stadium, could be operational by the end of 2021. It would save the city about $450 million to halt construction of the rail project at Middle Street, according to rail officials. By contrast, it would cost about $8.6 billion to build the rail line to the Kalihi transit station on Middle Street — about 5 miles short of Ala Moana Center, Robbins said in his memo, which includes a six-page Power Point presentation. Tsuneyoshi, who’s been pressing rail officials to be more accountable since she joined the Council on Jan. 2, said she’s still reviewing Robbins’ memo but sees it as a good starting point for a much-needed discussion. HART officials and rail supporters argue against ending the rail at Middle Street because they say cutting off the project from the most populated part of the island would reduce ridership, thereby undermining the system’s effectiveness. Rail critics, however, cite the dramatic jump in price for what was estimated in 2013 to be a $5.3 billion project. They are worried that the price will only increase as construction moves into the heart of urban Honolulu, where it will encounter more developed areas than it had during its initial 15-mile segment from East Kapolei to Kalihi. Robbins said the approximately $8.6 billion estimate to build to Middle Street “includes sunk costs in the City Center section of the project alignment that have been paid to date that would not be recuperated.” That would include costs for planning, design, utility relocations and right-of-way purchases, he said. The estimate does not, however, include potential savings from early termination of existing contracts because “any potential savings would be offset by early demobilization of crews and equipment, disputes, claims, and potential litigation from terminating contracts,” Robbins said. Tsuneyoshi introduced Resolution 19-29, which calls for a forensic audit of the rail project to determine whether there was any criminal activity that contributed to the spike in costs. The Council adopted the resolution March 8 shortly after HART officials received three separate federal subpoenas for documents and scathing audits by both state Auditor Les Kondo and then-city Auditor Edwin Young. Tsuneyoshi told the Honolulu Star-Advertiser the Council needs to have a serious discussion about whether it makes more sense to stop at Middle Street or continue to Ala Moana. While the memo indicated there may be negative impacts to the city reneging on its agreement to stretch to Ala Moana, the city could also experience other problems if it winds up scrambling for cash to reach the shopping center, she said. Tsuneyoshi said she also still has many questions about HART’s drive to find an entity to form a public-private partnership that would take on the cost of completing construction of the project and then operating and maintaining it for its first 30 years of existence. “I have questions about the viability of that process (and about) it getting us to the end,” she said, adding she’s also worried that handing over operations to a private party could further expose the city to liability. HART officials have insisted that a P3 arrangement would actually shield the city from more financial costs by handing over the reins to a private interest. An amendment to the Honolulu City Charter adopted in 2016 requires the city, through its Department of Transportation Services, to be responsible for rail’s operation and maintenance, not HART, so Council members need to be more involved in the process, she said. Current HART projections call for the first segment of the line, from East Kapolei to Aloha Stadium, to be operational by the end of 2021 and the full line, to Ala Moana, to be operational by December 2025. HONOLULU (HawaiiNewsNow) – In-person voting for the East Honolulu special election begins Monday as voters once again decide who will take the District 4 seat for City Council. 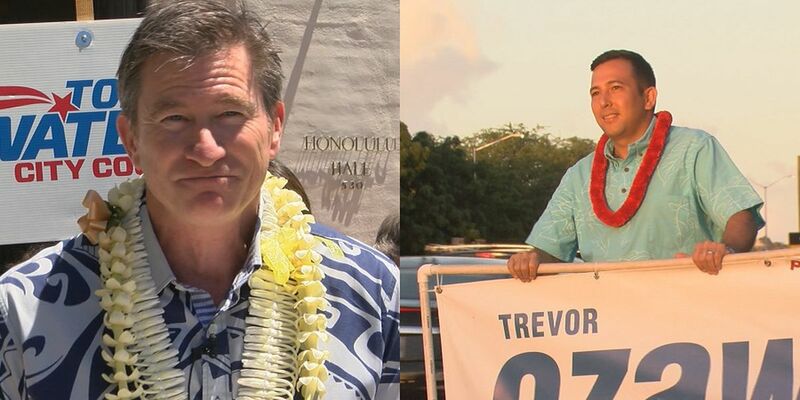 Doors open at 8 a.m. with voters choosing between Trevor Ozawa and Tommy Waters. The city’s election division website says residents who are not registered can register and vote between Monday through April 13. The hours are 8 a.m. to 4 p.m., excluding Sundays. On Election Day — April 13 — Honolulu Hale will be open from 7 a.m. until 6 p.m.
Mail-in ballots have already been sent out, but they must be received by 6 p.m. on Election Day in order to be counted. Some voters, however, have also been reporting issues such as receiving two ballots in the mail. Officials say there are safeguards in place to ensure no one casts more than one ballot. As of Friday, more than 17,700 mail-in ballots had been received. The special election is taking place after the November election results were invalidated by the Hawaii Supreme Court because of errors. Waters and Ozawa were separated by just 22 votes in the November election. Ozawa came out the victor and was expected to become City Council chair. But the state Supreme Court invalidated the results in a unanimous decision. The justices said officials improperly counted 350 late absentee ballots. In 2014, Waters lost to Ozawa by 41 votes. District 4 encompasses East Honolulu, including Hawaii Kai, Aina Haina, Kahala, Diamond Head and Waikiki. Some natural divisions and streets create the district’s borders, including the Koolau Ridge, Waialae Nui Stream, the Ala Wai canal, Ward Avenue, Ala Moana Boulevard, 9th Avenue and 11th Avenue. Atlantis as rendered on the existing land in Ko Olina. It would be built next to Disney Aulani. A rendering of an Atlantis at Ko Olina terrace. A rendering of the lobby overlooking the ocean. A Chinese firm is moving its estimated $1.5 billion Atlantis resort at Ko Olina closer to construction after more than two years of planning. China Oceanwide Holdings Ltd. applied for two infrastructure permits last year and has published renderings of the 1,400-room Hawaii Atlantis Hotel featuring an aquarium and a water park. The company declined to discuss any construction timetable, but the permitting work represents progress for a project that has attracted some skepticism. In November, Oceanwide applied for a water use and well construction permit that the state Commission on Water Resource Management granted in January. This permit allows the developer to draw 720,000 gallons of salt water daily from three proposed wells to feed aquarium and “aquaventure” features for the resort. Oceanwide also applied for a building permit in August to construct a retaining wall and shoreline path improvements valued at $500,000. This application is still under review by the city. Keith Vieira, principal of local hotel industry consulting firm KV &Associates Hospitality Consulting, said he wouldn’t be surprised if the Atlantis project takes 10 years to deliver, given that it’s one of the biggest and most challenging resort projects ever planned in Hawaii. Vieira said complexities for Atlantis include Hawaii’s construction costs, Oceanwide’s ability to move money out of China under restrictive Chinese government rules, environmental considerations, dealing with marine life and a project scope that dwarfs Disney’s nearby 800-room Aulani resort. Other observers have also expressed skepticism about Oceanwide’s plans for Atlantis, which were announced in late 2016 after the company bought 26 acres of land in front of two man-made lagoons at Ko Olina for $280 million. The skepticism stems from an initial projection by Ko Olina’s master developer that construction could begin in 2017, as well as recent difficulties with an Oceanwide condominium and hotel tower complex in Los Angeles, where construction abruptly stopped in January. Other projects previously announced for Ko Olina never materialized, including a “world-class” aquarium that was projected to break ground in 2007, a Hilton hotel announced in 2002, an Intrawest timeshare project announced in 2002 and a $1 billion resort called the Grand Ko Olina that was announced in 2005 and featured a “Shark Island” in an adventure lagoon. In Los Angeles, Oceanwide was on schedule to finish building a more than $1 billion condo and hotel complex with three towers this year. But the company ran into a financing problem that halted construction in January. According to Los Angeles Times stories, Oceanwide predicted work would resume in mid-February, but that didn’t happen. The Vox Media online real estate publication Curbed reported March 21 that construction was still stalled and that subcontractors had filed about $100 million in mechanic’s liens for work they did without being paid. An Oceanwide representative declined to comment on the status of construction and unpaid bills for the Los Angeles project. Jeff Stone, master developer of Ko Olina, in late 2016 said he expected that construction on Atlantis could start in mid-2017 and be finished this year. That appears to have been overly optimistic, especially considering that it took three years of construction for an initial phase of Aulani to open. Aulani was announced in late 2007, and construction commenced in 2008 as projected. The Disney resort with a water park opened in 2011. Sweetie Nelson, director of destination marketing for the Ko Olina Resort Association, speaking on behalf of Oceanwide, said the company deferred commenting on a timetable for building Atlantis. When the project was announced in partnership with Atlantis resort brand operator Kerzner International Holdings Ltd., Kerzner said the Hawaii property would be a “must see” attraction. “Atlantis will astonish and amaze, as well as celebrate the history and culture of Hawaii,” Jean-Gabriel Peres, president and CEO of Kerzner, said in a statement at the time. Some features at existing Atlantis resorts include scuba diving and dining rooms with underwater views. At an Atlantis resort that opened last year in China, underwater suites rent for $15,000 a night. The Atlantis Sanya project was developed by Chinese-based Fosun International for about $1.7 billion and is managed by Kerzner on Hainan island, which is sometimes referred to as “China’s Hawaii.” The roughly 1,300-room project was completed a little over four years after it was announced. Pictured is Audrey Shoji (L) preparing shower supplies as Yolanda Dela Rosa (C) stands by. Pictured are homeless who gathered for the services. Since November the operators of the city mobile hygiene center Revive + Refresh have been providing the Kakaako homeless with hot showers, meals and donated clothes twice a month. Volunteer Jessie Kim prepared food Thursday. For a video on the volunteers in Kakaako, visit staradvertiser.com. Pictured are homeless children, whose mother declined to identify, playing hide and seek amongst the donated clothes. Homeless Army veteran Anthony Olshefski, 68, enjoyed his lunch Thursday provided by the operators of the city mobile hygiene center, Revive + Refresh. Olshefski has been visiting the mobile center since it began last year. A Kaimuki couple with a new city contract to provide mobile hot showers for Oahu’s homeless are defying the city in two ways: by continuing to operate twice a month next to the Hawaii Children’s Discovery Center and by regularly feeding about 50 homeless people in the area. The head of the center has said it may be forced to close because of illegal homeless activity, including vandalism and drug dealing. Fong-Shoji said she and her husband are just trying to do whatever they can to help the homeless across Oahu. “I cannot provide them with housing, which is beyond what I can do, and I cannot deal with their mental health issues, which is beyond me,” she said. Fong-Shoji and her husband, Craig Shoji, founded the local branch of Laundry Love four years ago to provide laundry services to homeless people in Waimanalo. They both have full-time jobs: She’s a 50-year-old certified public accountant, and he’s a 54-year-old safety manager. After launching Laundry Love, the couple wanted to do more and won a $400,000 contract for five years to operate Oahu’s second mobile “hygiene center,” called Revive + Refresh, which they began towing to homeless encampments across the island in November. They’ve taken their shower trailer to Hauula Beach Park, Nanakuli Beach Park, Pope Elementary School in Waimanalo, Kaimuki High School, Parker United Methodist Church in Kaneohe and Beretania Community Park on the edge of Chinatown. Thursday night marked the seventh time that they’ve parked their trailer on Kelikoi Street on the Ewa side of the Children’s Discovery Center, their most visited location by far. But city and state officials are discouraging people and organizations from bringing food to homeless encampments, especially in parks. Instead, they say homeless people will get both food and professional help at homeless shelters. Several homeless people who enjoyed a meal and hot shower Thursday night had a different perspective. Friends Anthony Olshefski, 67, and Kalani Nicolas, 59, said it had been two weeks since they had a hot shower. Trying to clamp down on churches and organizations such as Revive + Refresh that provide food to the homeless is demeaning and insulting, Nicolas said. Revive + Refresh volunteer Kurt Himmler, 54, had been homeless for about two years in California and southern Nevada 20 years ago. Himmler’s homeless existence ended when a stranger offered to let him stay on his boat, where he could store his belongings, sleep in safety — and take hot showers. The idea behind Revive + Refresh is based on a San Francisco model to give homeless people a dignified place to get clean while social service agencies offer a range of services, including alternatives to sleeping on the street. So it only seemed logical to Shoji and Fong-Shoji to also serve their homeless clients food like rotisserie chicken, kimchee and chocolate chip cookies that they buy from Costco out of donations to their website, revive-refresh.org, and through their church, First Presbyterian Church of Honolulu at Koolau. “We also get rice from Zippy’s,” Fong-Shoji said. Annie Valentin, executive director of Project Vision Hawaii, operates its similar “Hiehie” mobile hygiene trailer on its own, without a city contract. At the city’s request, though, “Hiehie” stays out of city parks, Valentin said, and definitely does not serve food. But the defiant stance by the founders of Revive + Refresh could reignite the debate about staying out of parks. The stock held at around $87 in its first few minutes of trading — something of a modest IPO for such a giant tech company. Appetite for the stock was strong though, with more than 6 million shares traded at the open. The initial pop nudges Lyft’s valuation to $25 billion. Lyft‘s stock started trading on the public market Friday at $87.24 per share, more than 20 percent above its IPO price of $72. Lyft said Thursday that it sold 32.5 million shares — more than expected — at $72 apiece. That’s at the high end of the stated range, which was already boosted from an initial range of $62 to $68. That means the company raised about $2.3 billion from the listing. The stock held at around $87 in its first few minutes of trading before falling to $80 per share — something of a modest IPO for such a giant tech company. Appetite for the stock was strong though, with more than 6 million shares traded at the open. More than 19 million shares had been traded as of noon in New York, about 15 minutes after the debut. The No. 2 ride-hailing company revealed skyrocketing revenue in its IPO prospectus, but posted 2018 losses north of $900 million. The stock’s early performance will serve as something of a litmus test for public investors and their tolerance for mature, not-yet-profitable tech giants. “Lyft is popping the Dom Perignon today but how the stock trades over the coming months and especially once Uber comes out and goes public will be the real test in our opinion,” Ives said. HONOLULU (HawaiiNewsNow) – During a contentious Board of Regents meeting Thursday, members of the University of Hawaii’s faculty union blasted school President David Lassner for his handling of proposed budget cuts that would have forced dozens to lose their jobs. Lassner’s critics on Thursday said they were angry about the way he responded to that proposal, accusing him of not taking an immediate public stand against lawmakers. “I am really upset with our UH leadership,” said psychology professor Ashley Maynard. The plan to reduce the university’s budget was scrapped a few days after it was announced, once the administration had provided lawmakers with enough information to get those jobs off the chopping block. Maynard says it should never have gotten that far. Those who testified told Hawaii News Now that no one called for Lassner’s resignation during the meeting, but many agreed he needs to do more. “I’m feeling really abandoned by our leadership, that they were not taking a physical and vocal presence at the first announcement of the budget,” said Karla Hayaski, Director of the Kilohana Academic Success Center at UH’s Hilo campus. In addition to University president, Lassner also serves as the school’s interim chancellor. The faculty’s union president says he shouldn’t be charged with doing both jobs. “We did get the cuts reversed,” said Brent Suyama, who works in the university’s communications department. HONOLULU (HawaiiNewsNow) – All lanes of Halona Street in Kalihi have been reopened Wednesday morning following an emergency situation involving a homeless man requiring rescue from the nearby Kapalama Canal. Authorities responded around 4:20 a.m. to a man who was found in the canal under a bridge off Halona Street. Several Honolulu firefighters rescued the man by lowering themselves into the canal, stabilizing him and then hoisting him up and over the bridge, where paramedics then took over. It’s not clear what his current condition is or what led up to the incident.